From CAIR, “Ask NY Landmark Commission to Defend Religious Freedom” | the "silent" majority no more! 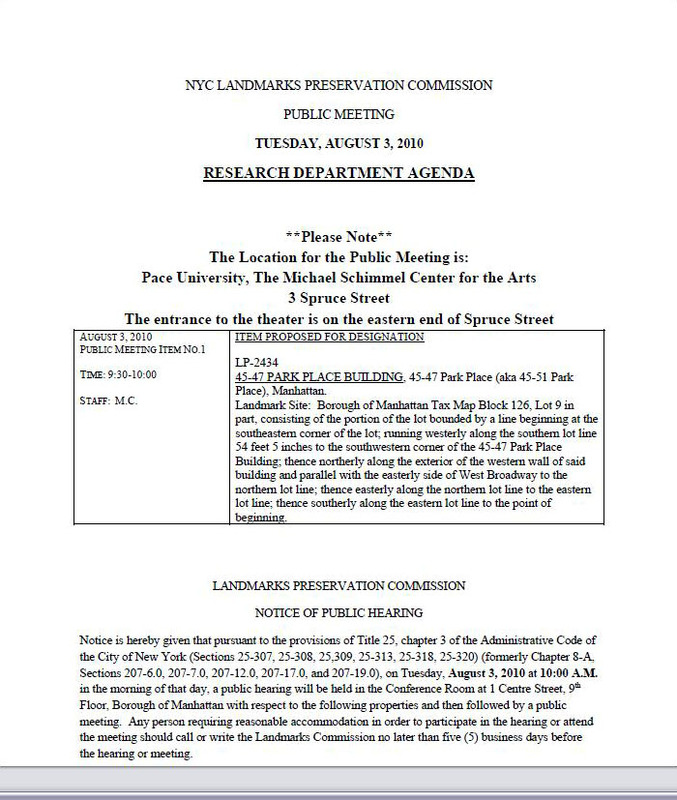 The Landmark commission notice. (click picture better reading) This will be over at 10 AM, if not before. They are shoving this through. (WASHINGTON, D.C., 8/2/10) — CAIR today called on American Muslims and other people of conscience to contact New York’s Landmarks Preservation Commission to ask that its members defend religious freedom and reject efforts by Islamophobes to block construction of an Islamic community center in that city. The commission will vote Tuesday morning on whether to grant protected status to the building that would be knocked down to make way for the community center. Sources say the existing building does not meet architectural criteria necessary for protection by the city. Opponents of the proposed Islamic community center sought to use the landmark process to block construction. He noted that CAIR recently called on the Jewish Anti-Defamation League (ADL) to retract its “shameful” statement against the construction of the community center. Awad said opposition to the New York community center and to Islamic centers nationwide is a symptom of growing Islamophobia in America. landmark process to deny American Muslims their constitutionally-protected religious and civil rights. 2. DONATE to support CAIR’s important work defending American Muslim rights.